Our dog is about two years old, about three years newer than our extensions. 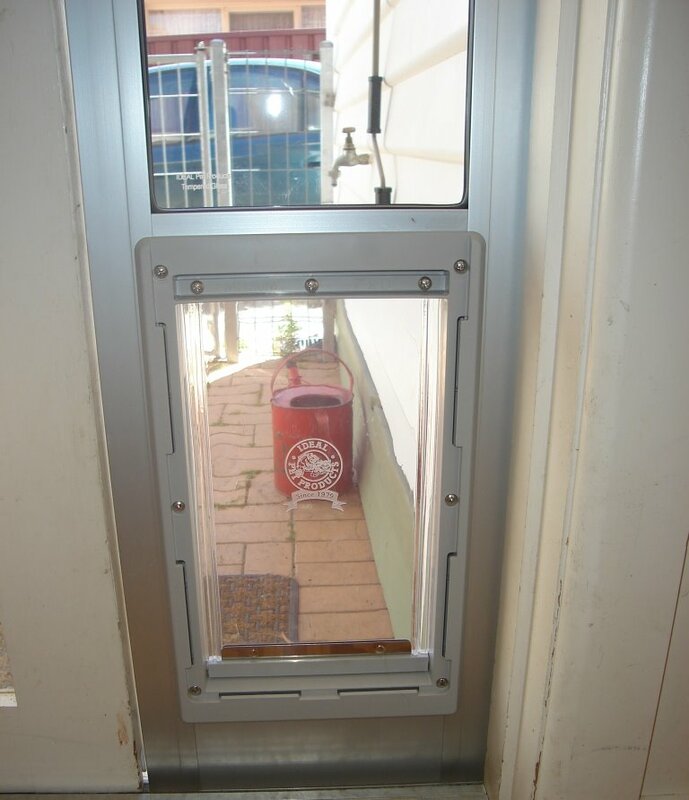 We didn’t factor in a dog door when we planned our extension, because at the time a dog wasn’t on the agenda. But now we have Emmi and she’s an inside/outside dog. For the past two years that’s meant that we’ve had to leave the back sliding door open. Good for her, not good for heating in winter, or cooling in summer. Particularly not good for keeping flies out. Because of the design, it’s been very difficult to work out how to incorporate a dog-door. But Eureka! We found one. At the curiously named ‘Pig in Mud’ online store. But our troubles were not yet over. Our door is too tall for the standard ‘Patio Dog Door’ and too short for the tall door. Of course. It was even too tall for the standard door plus the extension piece. Sigh. Many phone calls, a custom extension and delivery woes later the door arrived yesterday. Magic. It fits easily, keeps the flies out. What more could we want? Well, it’d be nice if the dog would use it. So far, she’ll use it if we lift the flap for her. But otherwise? No. So today, when she wants to go out, she calls me, as yesterday, the flies called me. 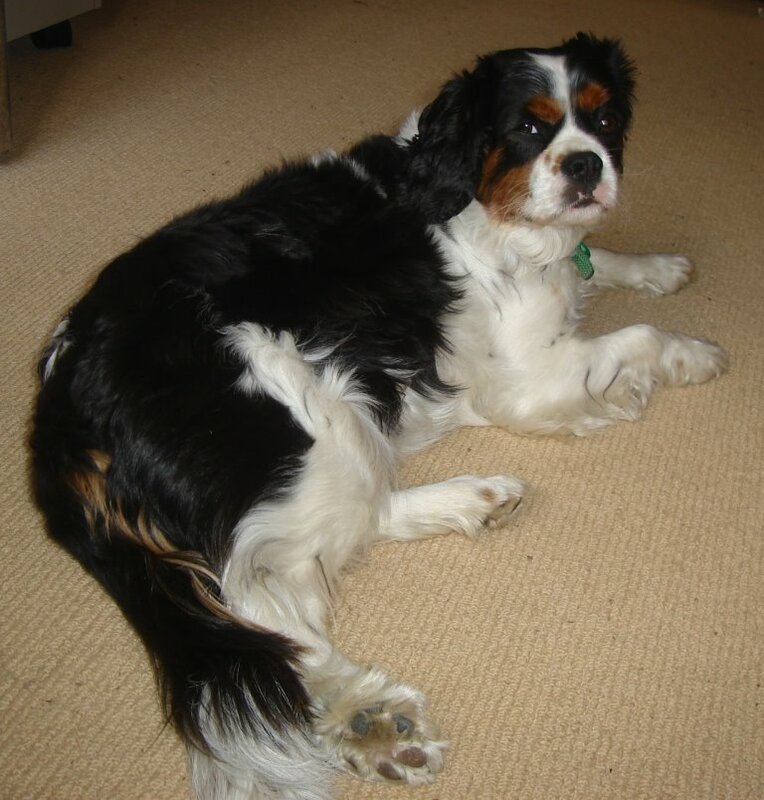 To mangle a proverb…you can lead the dog to the flap, but double-sigh, you can’t make her go through it. Fingers crossed that she works it all out. There is a parallel to writing, but I’m not going to explore it. I’m too busy helping Madam in and out of the back door. In the last little while I’ve been working on a few projects. One is a second story in what may one day be a series. The others are in the research stage. The first is a story set in early Melbourne, but not to do with gold. The second is around traditional stories. The third is the differences between sheep and goats. The first draft of the contemporary story is almost complete. In all three of the other projects, research is proving a little more challenging. The local library provided the starts, and the internet helps but I think I’m going to need to spend some time in town at both the Immigration Museum and the State Library. Should I be pleased that I’ve discovered an opportunity to fill a gap, or concerned that perhaps the interest/market for these topics isn’t there? Who knows? As my mother would say, time (and some more research) will tell. 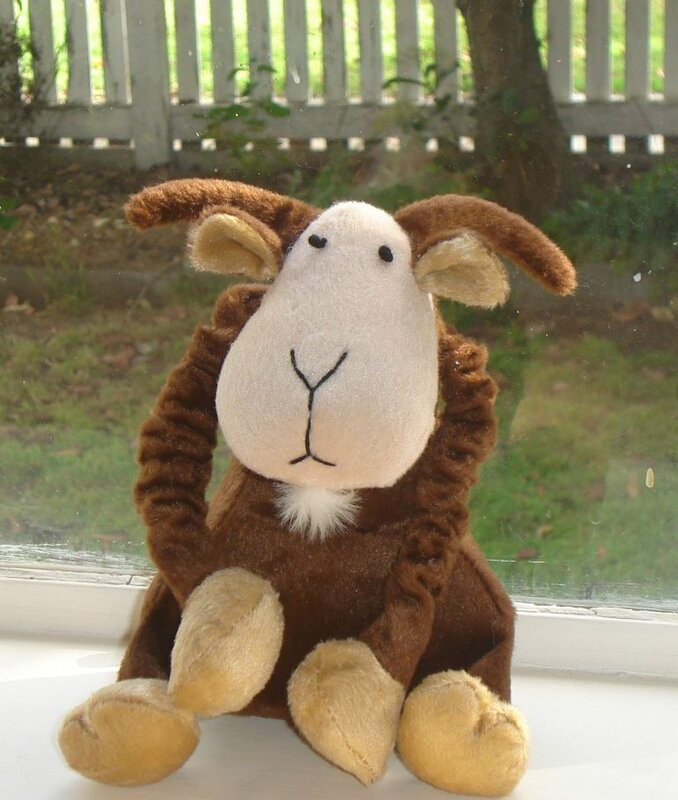 A little while ago I posted that I’d found a toy sheep that I’ll use when sharing my next picture book (Sheep, Goat and the Creaking Gate) with children. I also said that I’d struggled to find a goat toy. A friend read the entry and sent me some suggestions recently. The one she’d found was too small but it reignited my search and I found my goat! Thanks Sally, thanks RSPCA who stocked it as a dog toy. Emmi, our dog, loves stuffed toys and our back yard is strewn with bhe bits of the current favourite. When the goat arrived in the post, she was very excited and even more disappointed when the goat joined the sheep on top of my bookshelf. I’ve seen Judith’s roughs and they’re great. Can’t wait to see the finished artwork and the proofs. At this stage the publication date for Sheep, Goat is July 2009. Now to research the differences between sheep and goats. And the similarities.